I just got this fabulous head stamp from Indigo Blu ("Elizabeth Bennet") and had to use it. I decided to keep it very simple and just stamped the head on a side folded off white card (5.5"w x 4.25"h) then added some color using Prisma Colored pencils (green's for the BFly & bird, salmon for the flowers). A touch of Wink of Stell clear iridescent brush pen on the wings and bird's body. 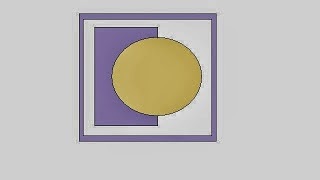 Dir cut a couple ovals using Spellbinder's oval die sets. Stamped the quote (Quietfire Design) with Versafine Black Onyx. Added a couple corners - another new die set from Spellbinder's "Gold Corners set One, sponged some Distress "Crushed Olive" in the crevices. Then used the olive pad against the edge of the card in a distressed fashion. As a final touch, punched a hole and tied the hand charm (also from Quietfire Design) with a piece of green string. Whilst this is gorgeous, our theme is actually that the bird be the main focal point, sadly the main focal point here is the woman. What a lovely card Yogi. The pop of colour on those flowers is just great. Thanks for joining us this week at Craft Your Passion. Good luck. Beautiful! Thanks for joining us for our "Keep it Simple" challenge at Crafty Creations. I hope you get to join us again real soon. This is so elegant and almost haunting in a lovely way. The pops of colour from the flowers, bird, and butterfly contrast beautifully with the black and white image. Love the simple oval around the sentiment and then those gorgeous corners. The hand charm is a delightful detail and finishes the card so well. Thanks for joining our Girly-Girl Challenge at Craft Your Passion this week. I hope we see you again very soon. This is a lovely project and a lovely image. Thank you for joining us at the Tuesday Throwdown Challenge this week! Stunning card! Thanks for joining Brown Sugar Challenge! Absolutely fabulous!! Thanks so much for playing along at CCCB!! Fab card !! Thanks for playing along with us at CCCB! 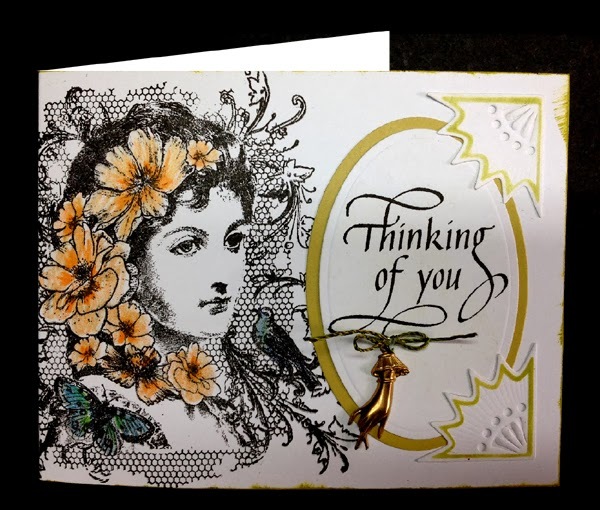 Beautiful vintage card, so simple and elegant. Thank you for joining our challenge at Crafty Catz and I hope you will come back again. What a beautiful stamp and looks good in such restricted colours - perfect for our Fashionista Challenge! Thank you for playing along at Ooh La La Challenge Blog and hope you will join us again tomorrow for a new challenge.